If you’re in the legal marijuana business and you’re looking to use social media as an outlet to educate your audience, you might want to think again. Want to post something to Facebook marijuana related? You might be out of luck. Earlier this year, the social media giant began a huge suppression on most companies who were using the site to promote their cannabis-related business. Take, for instance, Denver-based company Dixie Elixirs, who has long been a big player in Colorado’s medical and recreational marijuana product production. Earlier this year, in February, the Facebook page created for Dixie Elixirs mysteriously disappeared…along with its 11,000 followers. Apparently, the Facebook marijuana policy had taken a big turn with the social media giant explaining that Dixie Elixirs’ page was in direct violation with Facebook standards. Apparently, Facebook removes “any promotion or encouragement of drug use” (even in states that have medical marijuana laws), according to a notification given to Dixie Elixirs regarding their page being taken down. And they’re not the only ones experiencing this highly controversial backlash. Facebook has a bit of a confusing and complicated stance when it comes to cannabis. They say they don’t want to “promote drug use” and have taken action to remove any pictures or posts related to people smoking pot. However, they’ve allowed some companies to promote their cannabis-related content. Apparently, though, even their mind has changed about this, and they now control what they deem fit as far as any cannabis journalism content is concerned. Countless companies have been affected by Facebook marijuana censorship…which is a shame with social media being essential to the exposure and growth of marijuana-based businesses. Many of these companies (which are operating completely legally in marijuana-friendly states) were on Facebook for years. And when their pages were suddenly taken down, they weren’t given any warning at all. This happened to Incredibles, a Denver edibles company that’s been doing business (and maintaining a Facebook page) for years. And although they’re not doing anything illegal, their Facebook and Instagram accounts were shut down with a message that said they were violating policy. Despite many attempts to contact the company, the CEO of Incredibles, Rick Scarpello, hasn’t received an answer to exactly what the violation is. Apparently, you don’t even have to sell marijuana products for your social media accounts to be taken down. Center Mass Media is a cannabis marketing company who’s experienced the brunt of social media shutdown as well. The company has had several different Instagram accounts removed, which is actually something that has seriously impacted their business. Social media is something most businesses turn toward for advertisement and awareness. It can literally make or break a business, and companies rely on it to build followers and gain recognition. It’s also been a huge tool in marijuana legalization efforts and is the main source of information on marijuana law, policy, studies, medical information, movements, and more. What Are the Reasons Behind Facebook Marijuana Censorship? So what gives? 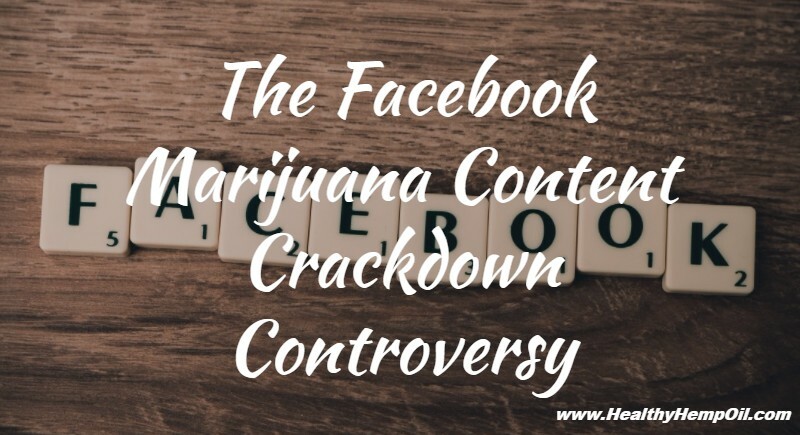 Why is Facebook marijuana censorship causing such a stir…and why can’t the company make up its mind about what direction to take with the countless companies who rely on social media to make a change? There are several rumors as to why social media giants are shutting down pages that pertain to pot use. Some say companies within the cannabis industry are flagging their competitors’ content and posts in an attempt to get them shut down. Businesses don’t always play fair, and the fierce competition between cannabis companies is a perfect example. Others say that Facebook is frightened to receive racketeering charges from the federal government. This is a reason most banks won’t even come close to touching marijuana money and a viable reason Facebook marijuana content is taken down in droves. The Crackdown on Facebook Marijuana Content Creates New Social Media Platforms…But Is This Enough to Allow Companies to Reach Their Targeted Market? The Facebook marijuana content crackdown, however, has spawned a new image for the online social media presence of cannabis-related businesses. In 2013, MassRoots hit the social media scene. This Facebook-like platform lets companies and individual users create profiles, share information, learn about trending news, advertise, and promote pot-specific content. Duby is another pro-pot platform that works just like Instagram…only it encourages pictures of cannabis-related content. It works by encouraging users to post images that are implied as “dubys” without their pictures being taken down. Social High is yet another social media startup hoping to create a platform that offers what the Facebook marijuana policy takes away. Although launched in 2015, Social High has already amassed a number of followers in 50 different states and 65 countries. This platform is one where users can talk about different strains of cannabis without criticism from others…or fear of getting their accounts shut down completely. While these attempts are not without warrant (and are a giant step forward in the marijuana social media scene), it’s the big players like Facebook and Instagram that companies rely on to get their messages to the masses. The people using cannabis-specific sites are the ones who already know about marijuana use. And while there’s always more to learn, it’s reaching those who aren’t educated about marijuana that is crucial to building business. Those who stand behind the legalization of marijuana and the companies running legal businesses that pertain to marijuana use believe the time has come for the big-name social media companies to begin taking marijuana legalization (and the businesses behind it) more seriously. It’s no secret that the legal marijuana business is big business indeed. It’s a multi-billion-dollar industry with businesses that are helping local and statewide economies boom, and one that many believe should be backed by the social media platforms the majority of people are using. And as far as the companies that have already been shut down…many refuse to give up in the face of adversity. Unfortunately, their attempts are often met with a blind eye. Dispensaries are often hardest hit, and many have had their accounts taken down after years of running business as normal as far as social media standards were (once) concerned. Cannabis companies are demanding clear guidelines concerning what they can and can’t get away with on social media sites. The Facebook marijuana counterattack is regrettably becoming the norm…and there doesn’t seem to be much these cannabis-based companies can do about it. We’d love to hear your opinion about the stance Facebook and Instagram have taken against marijuana and the companies that back marijuana products, information, and legalization in the comments below.